In Beas 9.2 PL 06 and newer, we use the b1up crystal viewer. 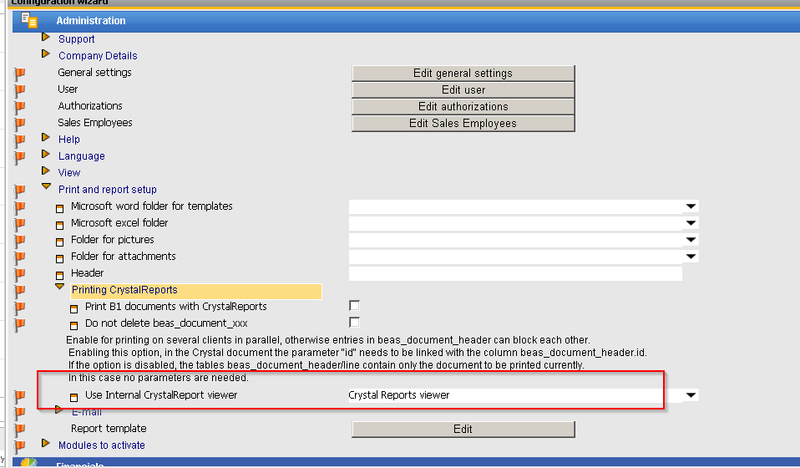 Crystal-Message: Failed to export the report. Please start Database-check (for convert UDF-Max-Fields) or check the Crystal-Report (SQL statements). System-Message: Error Calling external object function export at line 260 in function of_makro_output_crystal of object ue_reportobject.. Solution: Uninstall the Microsoft Windows update and restart the machine. Reason: In many cases, SBO created fields of data type varchar(max) which is not supported. Solution: Run the datacheck in Beas to correct incorrect fields. Can also occur at the message "... Please Start Database-Check ...". Please choose "Database-wizard" - connection in the crystal-report data. Data has to be an ODBC (RDB)-connection. Another connection types eg. ADO.NET and others are not supported. Beas uses the Library of Crystal Reports. This needs to be installed, to display Crystal Reports in reports. Usually, the Library is installed automatically. If the installation was prevented or did not work, you can install manually. In SAP - Server - Folder B1_SHR\\Beas software\reportviewer the MSI-Installer is located. It can be executed subsequently. Reason: One reason may be that the database name contains a dot "." This could happen when copying a database. Reason: In Report Database Connection must be an ODBC Driver. and the name of this ODBC connection must be "BEAS_SAP" for MSSQL version and "BEAS_HANA" for HANA version. Solution: Please use only ODBC Driver for connection to the database in the Crystal report definition. Reason: error in Crystal-Engine Version XI, which is used by Beas for export into PDF-format. Please download attachment for your SAP client, this depends if you're using 32 or 64bit. Could you please verify that knowledgebase article number? It doesn't appear to be valid. UPDATE: The KBarticle that is referenced doesn't exist. The correct KB article is KB3102429 . Thank you for the information, now the number is updated to KB3102429.